Gentle & easily absorbed. Helping reduce tiredness. Supporting a healthy immune system. Supporting normal cognitive function. 14 sachets one-a-day. Vegetarian Society approved.Iron is an essential mineral for carrying oxygen around your body, helping maintain energy, normal cognitive function and a healthy immune system. 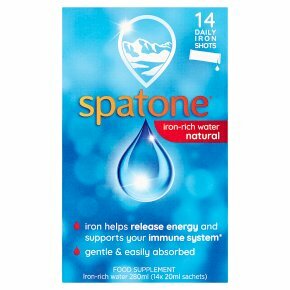 Spatone is scientifically proven to provide a highly bioavailable source of iron. The iron is naturally occurring in water, so its readily and gently absorbed by your body and should cause fewer of the side effects associated with typical iron supplements, such as stomach irritation and constipation. Packed in convenient, daily sachets, ideal to use on the go. Directions: Adults and children over 2 years: take one sachet daily Pregnant Women: take two sachets daily Ideal for everyone over 2 years old including pregnant and post-natal women, children, athletes, vegetarians and the elderly. You can really taste the iron in-Spatone! Add to fruit juice containing Vitamin C to improve the taste and increase the absorption. Spatone is kind on your stomach and has fewer unpleasant side effects often associated with iron supplements.